It may not have been the serene setting of The Grange or the leafy surrounds of Carlton CC, yet there was something appealing about watching beach cricket being played for the first time in Edinburgh. The venue for the milestone match was Silverknowes Beach looking out towards Cramond Island and the location, if not the weather, was perfect for the landmark occasion. Despite torrential rain just as the game started, the two eight-man teams threw themselves wholeheartedly into the 16-over match. Thankfully, the rain eventually eased. Locals out for their evening stroll or families walking their dogs all stopped in their tracks at the sight of the action unfolding before their eyes with The Submariners and The Barracudas all clad in traditional cricket whites. Groups of people also gathered around the boundary edges to get a closer look at what was going on. And there were some top sportsmen on view, with the likes of former Scotland rugby stars Hugo Southwell and Jamie Mayer, Scotland World Cup seamer Ali Evans and former Ireland one-day internationalist Rory McCann all involved. Shouts of ‘howzat!’ or ‘catch it!’ competed with the shrill cries of the seagulls as the cool August sun began to set. With a live three-piece band pumping out the tunes in front of the nearby Boardwalk Beach Club and the mouth-watering smells of a barbecue drifting across the promenade, you got the feeling that with a little support, this kind of thing could really take off. All that was missing was perhaps sipping a gin and tonic or a nice cold beer as the game unfolded. That may still come should the Boardwalk ever become licensed. This wasn’t an evening for chilled refreshments, though, the night more in keeping with the coffees, cakes and hot chocolates on sale. While the Scottish weather remains as unpredictable as ever despite the long, hot summer, staging games in the afternoon with a bit more warmth in the sun would be preferable. However, just as Elie across the water has its regular matches played out of the Ship Inn, so Edinburgh could well have a new fixture on the sporting calendar based at the Boardwalk Beach Club. Owner Eddie Tait whose idea it was to stage the match, is convinced the three-mile promenade has a vast untapped potential and is hoping that the beach cricket will help attract further events. He is already championing a viewing platform on Cramond Island, and has discussed plans for a botanical garden to help enhance the promenade and put Edinburgh’s coastline on the global map. “It was great to see the area come alive in the evening and hopefully people can see the potential which this forgotten piece of coastline offers,” he said. Roy Leckie, a director at Walter Scott & Partners in the city, was manager of The Barracudas and added: “As far as an experiment is concerned, I think it’s fair to say it was a resounding success. 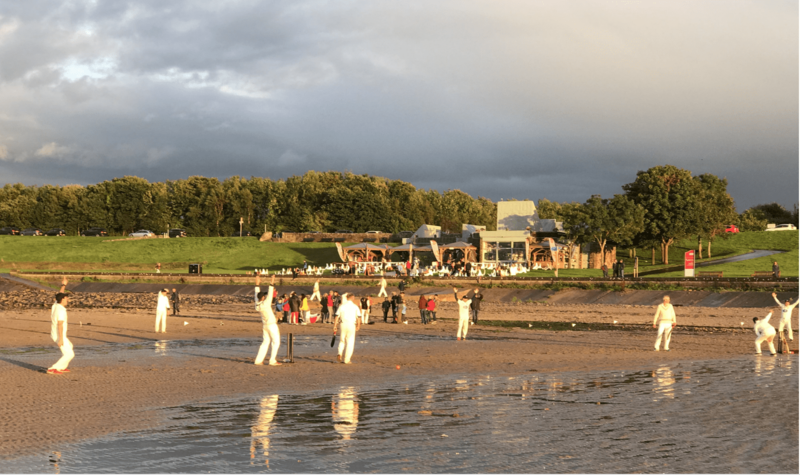 “It’s great to have beach cricket in Edinburgh and I think there will be enough interest from people in the city to form a league for next year. “That would be fantastic for the area as there is no doubt it has been under-used for far too long. The result seemed immaterial at the end, both teams having really enjoyed the occasion. For the record, the Submariners torpedoed their opponents with a rematch already being discussed.